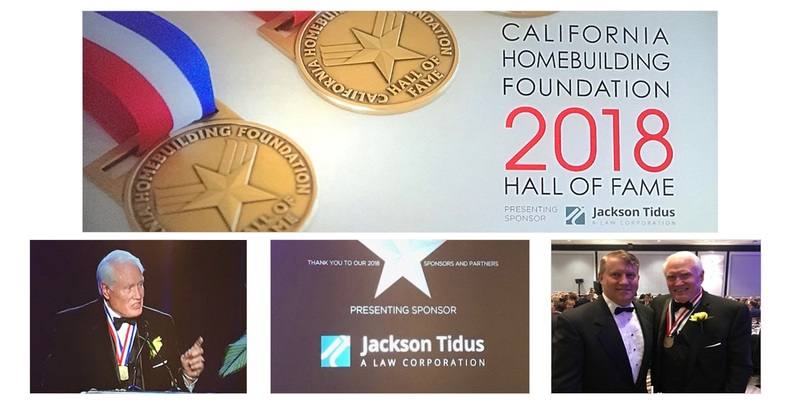 IRVINE, CA – Jackson Tidus is proud to announce that co-founder Scott Jackson was inducted into the California Homebuilding Foundation (CHF) Hall of Fame at the CHF Hall of Fame Gala in San Francisco on June 26, 2018. This honor recognizes Scott’s decades-long contributions to the homebuilding industry, highlighting his exceptional legal career and charitable efforts. Induction into the CHF Hall of Fame, a recent recognition by the California State Legislature and numerous philanthropic awards show that Scott has fulfilled the promise of leadership cultivated at the United States Air Force Academy and during his years of military service. The CHF was founded in 1978 and invests in the future of the homebuilding industry. Its work includes providing college and graduate scholarships, funding research on key public policy issues, compiling and publishing timely construction and new home statistics, and providing training seminars. The CHF Hall of Fame is the homebuilding industry’s top award, recognizing industry leaders and offering their career examples as an inspiration to others. There are only 226 honorees in the CHF Hall of Fame and Scott is one of only two attorneys in the 34 years of the CHF Hall of Fame and the only current practicing attorney. Scott is a founding member of Jackson Tidus, a top full-service law firm in California serving the real estate industry. He has been named to the Southern California Super Lawyers List every year since 2002, as chosen by his peers. Scott chairs Jackson Tidus’ Subdivision Group, which has created over 3,000 residential, mixed-use and commercial owners associations for builders and land developers. Under Scott’s direction and guidance, the Subdivision Group has become nationally recognized for its innovative approach to the development of master-planned communities, mixed-use developments, age-restricted communities, residential and hotel condominiums, traditional residential condominiums and planned developments, transit-oriented developments and commercial, retail, office and industrial projects. Scott is widely recognized as one of the top experts in his field. He has been described as “a leading commentator” by the California Court of Appeal and his writings have been cited with approval in two California Court of Appeal decisions and one California Supreme Court decision. Scott has also assisted in drafting legislation passed by the California State Legislature, including the Davis-Stirling Common Interest Development Act for which he was honored by the California State Legislature in 2015. He has also given expert testimony in cases involving common interest issues for more than 100 California law firms. Scott is an author of several books and articles including two annually updated chapters in Forming California Common Interest Developments, published by the California State Bar. He also co-authored the textbook Business Condominiums published by the National Association of Home Builders and has also edited three chapters for the California State Bar in the book entitled Advising California Common Interest Communities. Scott’s work for the Home(ful) Foundation, and its predecessor the Lennar Charitable Housing Foundation, provide an example of Scott’s unique legal approach. He developed a legal framework that created a new source of funding for homeless services through home sale donations. As a result, during the last 10 years, over $10 million has been donated to over 100 housing charities. Scott has fostered a legacy of volunteering and community involvement at Jackson Tidus. Whether legal, industry or community based, Jackson Tidus and its attorneys support over 100 nonprofit organizations through membership, board service and financial contributions. This culture of giving was recognized in 2017 when Jackson Tidus was honored with a Spirit of Volunteerism Award as a result of donating 508 hours of legal services to Habitat for Humanity OC. Scott and his wife of 51 years, Susan, live in Newport Beach. They both love spending time with their son and daughter-in-law and can often be found at sporting and school events of their four grandchildren. Scott was a co-captain of the United States Air Force Academy’s football team and had the honor of playing on some of the nation’s most hallowed grounds in sports, including Soldier Field in Chicago. His love of sports now continues on a different type of grass, with weekly golf outings, highlighted by a trip to Scotland and several very special rounds of golf at Augusta National Golf Club.